Everett Memorial Stadium baseball field. Photo courtesy of Everett Memorial Stadium Facebook page. From a Snohomish County news release. The Snohomish County Council entered into an interlocal agreement with the Everett School District to help fund improvements to the Everett Memorial Stadium baseball field the week of October 16, 2017. Snohomish County will fund $300,000 of this project in the agreement with Everett School District, which will fund approximately $1,800,000. The Everett Aquasox will also contribute $300,000 for the project. Everett Memorial Stadium opened in 1984 and was built on land donated by the Elks in memorial to those who gave their lives in World War II. 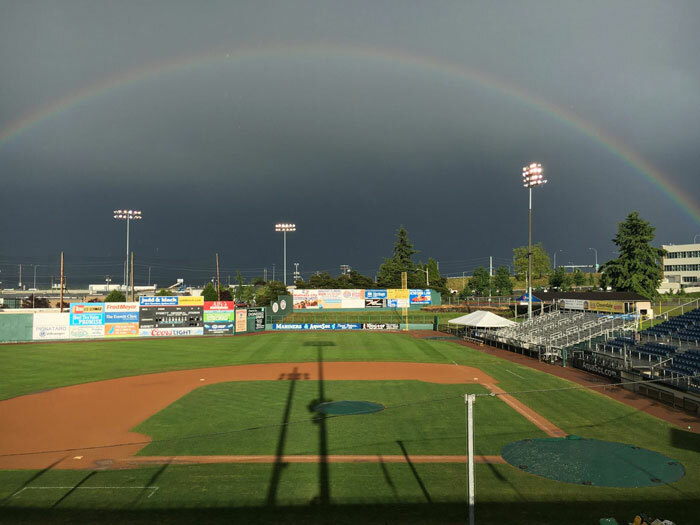 The baseball field is used by the school district for their athletic programs, and is the home field for the Everett Aquasox. The most recent major improvements to this facility were in 1998 and funded by the hotel/motel tax. Recent seasons have been plagued by bad weather, with rain events making the field unusable for much of the school district’s planned games. The project will remove the existing infield, outfield and warning track to replace the drainage system with a fast drain design. It will also replace the existing natural grass surfaces with synthetic surfaces. The Everett School District has all contractors in place and expects to break ground on this project as early as the week of October 23rd. If weather cooperates, they expect to be playing on the improved field as early as March.